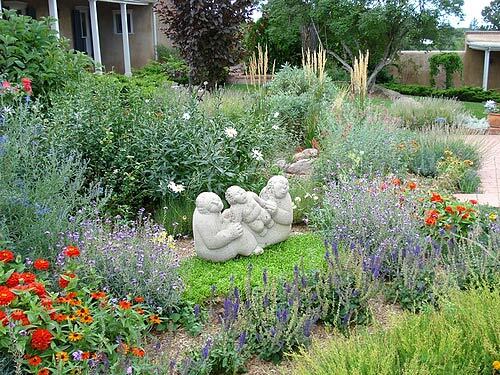 Xeriscaped, sustainable landscaping doesn’t mean gravel, rocks and cactus! 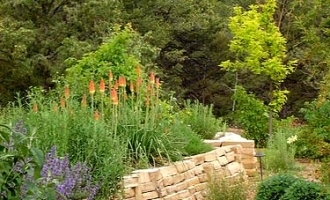 A lush, water-wise landscape is possible with native plants, perennials, passive permaculture water harvesting, capturing rainwater in cisterns, and using drip irrigation. 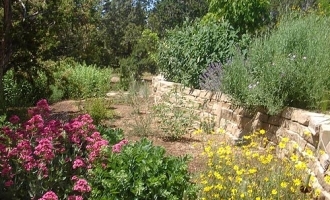 The RainCatcher uses permaculture landscaping and xeriscaping techniques to create sustainable landsites that thrive without the constant intervention of human resources. 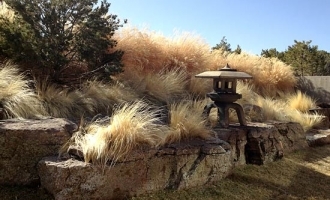 These landsites can take some time to fully establish, and require a good amount of energy and invested resources to get started. 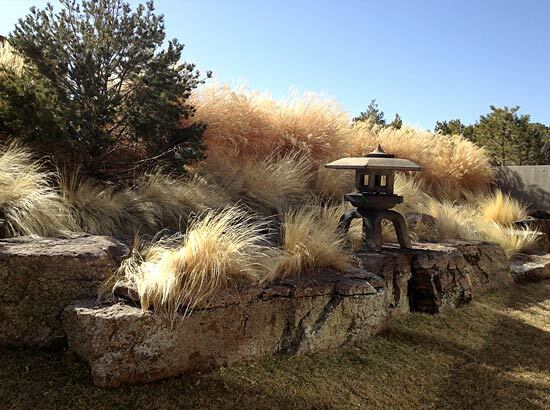 In the high desert where soil is extremely fragile and water is limited, design is the most critical factor. 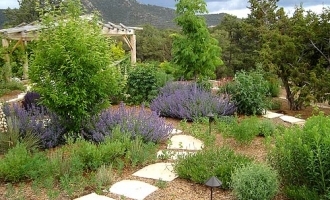 Sustainable landscapes eventually provide a merging and constant working relationship between the plants and organisms living within the landscape. 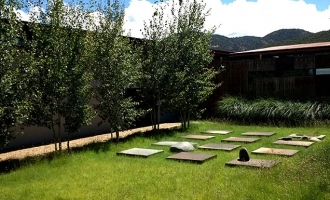 What goes into a sustainable landscape? 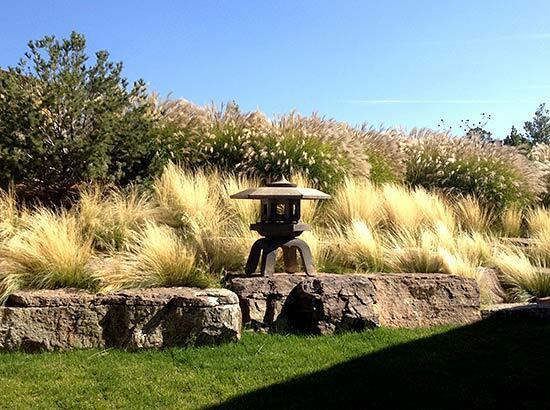 A sustainable landscape requires more thought in regard to design than other landscapes. 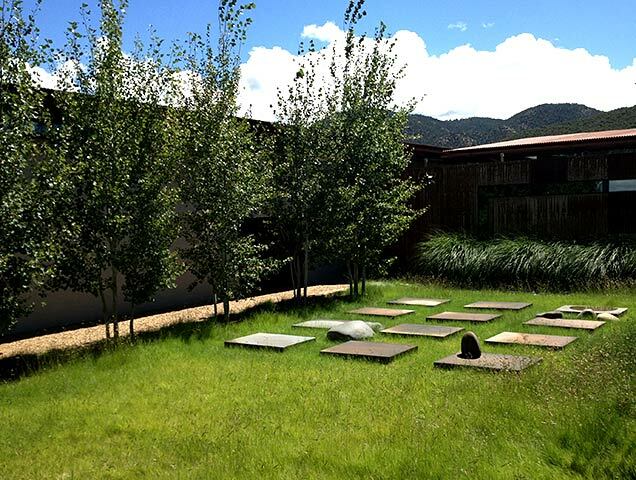 In order to create a healthy, vibrant, self-sustaining landscape we need a well thought-out design and an implementation plan, even if it is over several years. One of the most important aspects of a landscape is trees. 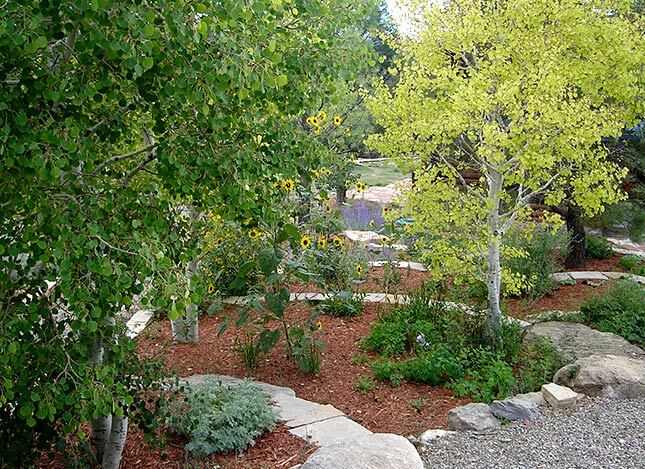 Trees provide shade, cool the ground, provide organic matter/mulch, pollination, color, wildlife habitat and food – for us and for the surrounding wildlife. Nutrients from deep in the ground are transported by trees to the top of the soil by leaves. As time goes on, it is easier to establish plants under the canopy of a tree because they are protected and don’t need to compete with the tree for resources. 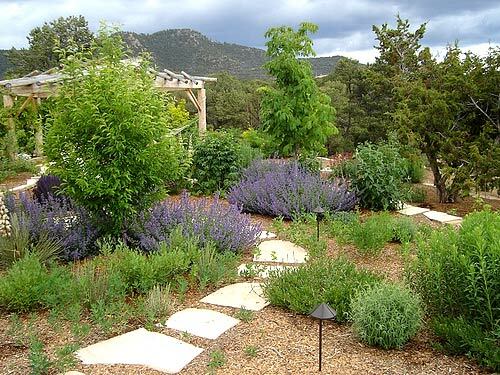 Landscaping can incorporate terraces with hardscaping, shade trees, mulch and pathways to break up large areas of land and add interest and personality. 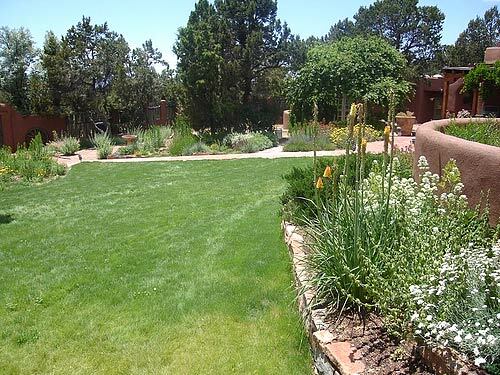 Extremely xeric plants do not want to be planted under trees necessarily, but most all plants can benefit from trees. 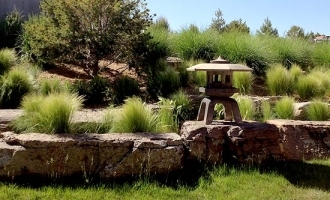 The RainCatcher uses xeriscaping and water-wise landscaping to create a sustainable, well-planned and beautiful landsite. 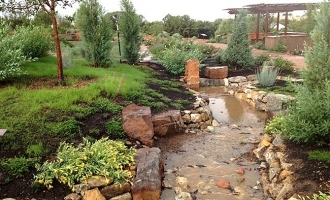 A landscape that focuses on water harvesting and soil building will need less water over time from unsustainable means (wells, city, municipal water systems). 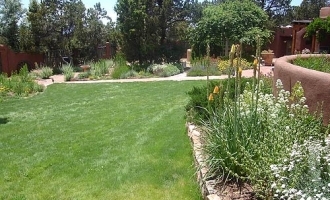 This is the first step towards creating self-sufficiency in a landscape. 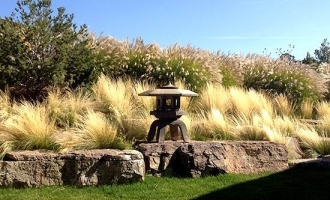 We can help with the design process and plant options to make your site as sustainable as possible. Why is planning and design critical? Design provides a basis for all of our ideas to be on paper so they can be thought through, evolve and possibly be modified at a later date. 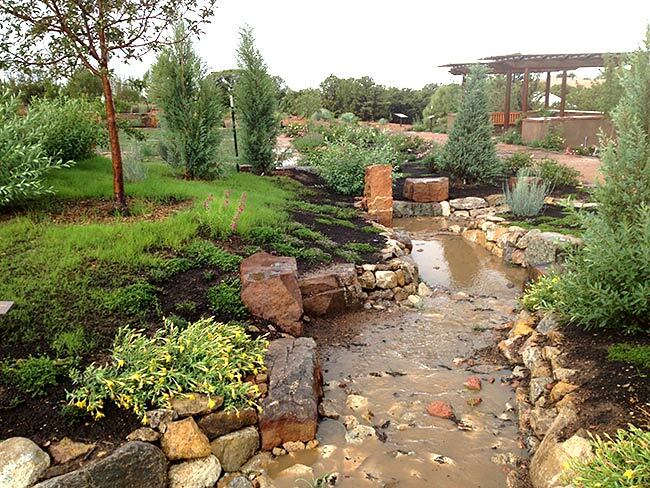 Planning can help to strategically utilize existing resources like rainwater, trees, native shrubs and terrain. 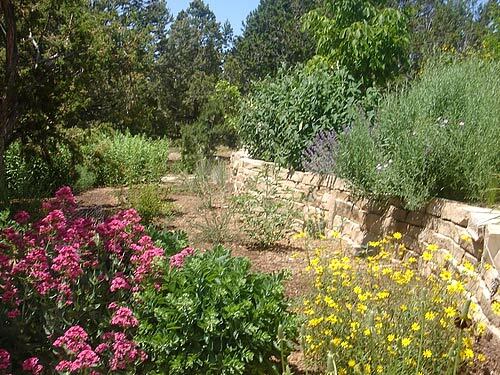 It can also help increase co-habitation of native plants, beneficial insects and animals, and save money by anticipating future needs and possible problems. 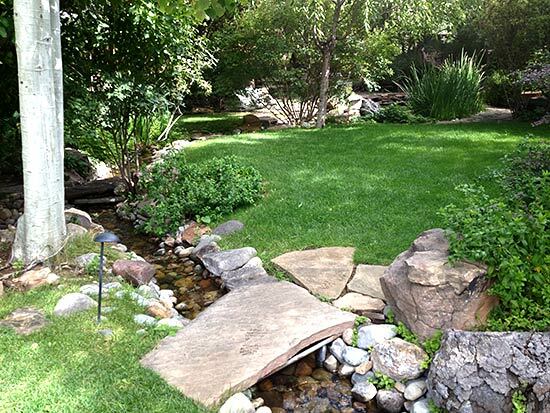 It may take some time upfront to get it finished, but in the end, changes that are made to the landscape are minimal. 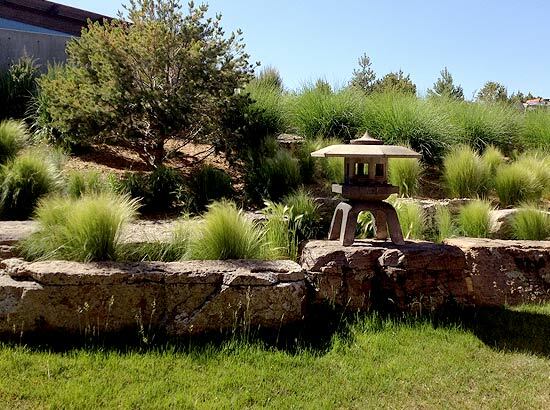 We can help you design your landscape with a relaxing water feature, areas of native grass, stonework and hardscaping, and of course water-wise plants, shrubs and trees. 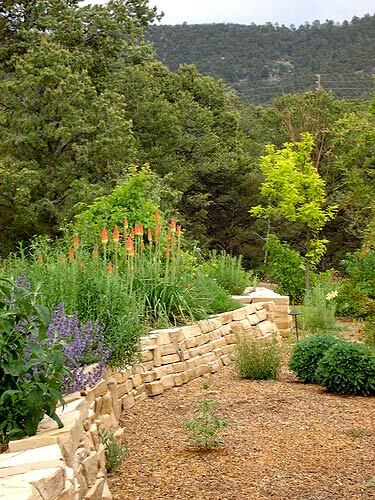 How much land do I need to create a sustainable landscape? How would consulting with The RainCatcher be more cost-effective in the long run?